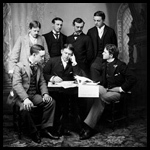 A listing of web-based exhibits and digital collections featuring materials from the North Carolina Collection research library, the North Carolina Collection Photographic Archives, and the North Carolina Collection Gallery. 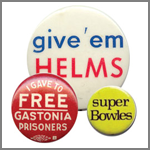 This online exhibit showcases a selection of campaign buttons and other materials from the North Carolina Collection Gallery’s holdings of political memorabilia. 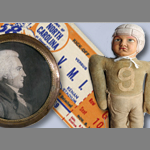 A selection of artifacts from the North Carolina Collection Gallery that represent the history of UNC throughout its entire existence, from the 1793 plaque laid with the cornerstone of the first campus building to objects from the modern era. 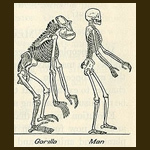 This online exhibition examines the controversy surrounding the teaching of evolution in North Carolina public schools and universities in the 1920s. Focused primarily on events related to the 1925 “Poole Bill,” the website contains an introduction, timeline, and key primary sources introducing the topic. 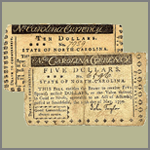 This digital collection presents a variety of North Carolina currency from the mid-eighteenth century through the Civil War. 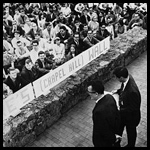 This primary source toolkit introduces students and researchers to one of the most significant elections in North Carolina history. 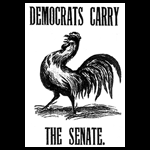 This site includes many original sources, including controversial and influential editorial cartoons from the News and Observer. 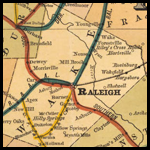 A comprehensive online collection of historic maps of the Tar Heel State. Featuring maps from three of the state’s largest map collections — the the North Carolina Collection, the North Carolina State Archives, and the Outer Banks History Center. 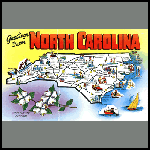 This digital collection contains a wide-ranging selection of postcards depicting scenes from all over North Carolina throughout the twentieth century. 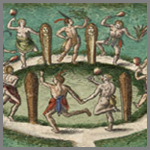 This online exhibition displays images from a rare, hand-colored 1590 volume in the North Carolina Collection containing the earliest published illustrations of North Carolina. An exploration of events that tested the University’s commitment to academic freedom and free expression from the 19th Century to the 21st. A digital version of an exhibit that appeared in the North Carolina Collection Gallery from February 21 to June 2, 2013. 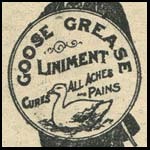 An online presentation of a North Carolina Collection Gallery exhibit highlighting treatments for common and not-so-common illnesses in North Carolina in past centuries. A selection of student publications from the University of North Carolina at Chapel Hill, 1844-2005. Based on an exhibit in the North Carolina Collection Gallery.